So I am stepping WAY WAY WAY out of my comfort zone. Next week, I’m heading to New York City for the annual BlogHer conference. It’s a three day conference celebrating all things blogging. I’m heading down a day early for the pre-conference HealthMinder day, which will have specific special needs panels. If you don’t know me, you may not know why this is feeling so out of my league. I’m the one much happier behind a computer screen than in a crowd. At a party, I’m hanging by the food and drink table or leaning up against a wall in the corner. I prefer to stay quiet, unnoticed. I get anxious and nervous at Costco, so giant conferences make me edgy. But I just had to go to this one. And I have four reasons why. Reason #1: In addition to writing here I’m also the managing editor at two other blogging sites. For over a year now, I’ve been a part of the amazing team at the SPD Blogger Network, a group blog for parents of children with sensory processing disorder. The site has a special place in my heart. SPD was Howie’s first diagnosis. Two years ago, when I started to write my own personal blog here, I connected with Hartley Steiner at her blog. She encouraged my writing and put my blog on her site. When she founded the SPDBN, she asked me to be there to help. And there I’ve stayed. We’ve created a loving, supportive and understanding community there on the blog site and on our Facebook page. It’s the place I come to when I’m feeling particularly low or incredibly proud. Every story is shared with honesty and love. I understand my son better because of the incredible people who write for us every day. The SPDBN relies on posts from parents. Each day we post a new story. I’m going to BlogHer to meet other parents who share a similar journey and I hope I can convince them to come write for us. The other site I help manage is The Oxygen Mask Project. It was started with my friend Shannon as a way for us to reclaim ourselves, reminding us that we need to take care of ourselves if we’re going to take care of our kids. It started small. We started tweeting with the #yearoftheoxygenmask, sharing what we had done for ourselves that day. For me, it was drinking my coffee when it was hot. And showering. While to many that sounds stupid, for me just doing that was a challenge. I was so busy getting people out the door to school/therapy/baseball/piano/therapy that there was never anytime for me. I hit bottom. And now we have 880+ Facebook friends and 52 posts from writers from all over the world. And every day we’re talking about how we’re important too. There will be a special panel at HealthMinder day called Overcoming Burnout: Replenishing Your Reserves. I’m going to BlogHer because this is exactly what we’ve been talking about for six months. Reason #2: Two of my favorite people are being honored at the special Voice of the Year. I can’t wait to hear my friend Varda as a reader for the “Heart” nominated posts. I expect there to be very few dry eyes in the house. And I’m so thrilled that my friend Stimey was nominated as a Voice of the Year for her incredible post Not Even Wrong. This post changed my life. That’s not hyperbole. I read it at a time when we were having tremendous struggles with Howie and school. 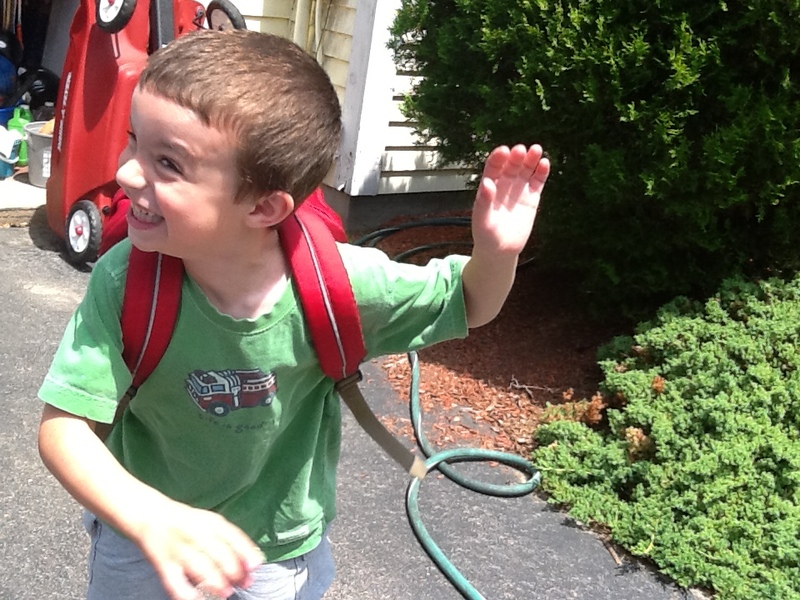 Her post about her son Jack changed EVERYTHING about how I viewed Howie’s school life, and made me step back and look at how we needed to teach him. Because my perspective changed, I was better able to communicate with his team at school and we all turned things around. I am forever grateful to Stimey for what she wrote. I’m going to BlogHer to tell her in person. Again. Reason #3 goes with Reason #2: I’m going to be with friends. Including friends I’ve never met. And, yes, I know that probably only makes sense to the blogging/social media world. The best example of this is how I met my BlogHer roommate, Kristin. Last summer, my kids’ school opening was delayed a week due to Hurricane Irene. I was completely stuck for ideas on how to entertain them when they were supposed to be in their classrooms. I whined about this on my blog’s Facebook page, and this angel named Kristin asked if I wanted to join her and her boys at their swim club. We had never met, but had a mutual Facebook friend and had become friends that way. I sent her a message saying simply YES! We chatted via email and text, and there we were at her swim club for the whole day. Our boys played and swam – sometimes together, sometimes doing their own thing. And because we were both autism moms…well the rest is history. We’ve only seen each other once since that day at the pool. But when I decided to go to BlogHer, I asked Kristin if she’d go too. In addition to her amazing blog, she’s also written for the SPDBN and The Oxygen Mask Project. So now we’re taking the bus together down to the big city, and I’m hoping she’ll help me get out of the corner. But this is what blogging has done for me. In addition to the incredible “in real life” friends I had, I’ve connected with a whole group of insanely smart, funny, snarky special needs parents who have taught me so much just through their words. I’ve been lucky enough to meet some of them before and now count them as my closest friends. I can’t wait to meet this friend, and this friend, and this friend, and this friend, and this friend. I’ve been reading their work for so long and now I get to put a face with the words. And I’m hoping a few other friends will come join me for a drink or two. Or three..
I’m going to BlogHer to connect with the people who have taught me so much. Reason #4: I need to get away. I’m not going to lie. This has been a long long summer. I need a little break. In addition to the usual summer things, I’ve started a new project and it’s been a lot of work to get off the ground. I’m stressed. And I’m taking it out on the kids. I need a break to sleep. And shower. And pee alone. I have to get some time to regroup. To feel better. To breathe. I’m going to BlogHer to find myself again. I’m terrified of the three days away from my family. I’ve never been gone this long. But I know Tim and the boys will be fine. We have an incredible support system around us here who will help if (when?) things get sticky. I will have a social story ready for the boys so they are prepared too. And when I come back I will be ready to take it all on again. I’m stepping out of my comfort zone and going to BlogHer’12. See you there. I’m at the SPD Blogger Network today. With my moment of freedom as a parent. I knew from the moment his head peeked around the bus seat that he had had a rough day. When Howie’s upset, his whole face scrunches up into a giant frown. He would have the worst poker face. My own face must have given me away when I looked at the bus monitor. I grabbed Howie’s hand and walked him off the stairs. We stomped together down the driveway. I asked if he wanted to talk about it. It was 95 degrees outside and 99% humidity. Howie started pacing in the garage. Somehow, I convinced him to come inside. More stomping. He sat down in his beloved green chair. His face was still frowning. From the other room, we could hear Lewis working with his home ABA therapist. They were playing a game, talking quietly. Howie looked at me. He wiped away a tear. Leaning over, he whispered in my ear. Gave me a little smile. Wiping away a tear myself, I sat down. The three of them played the game. Incident free. Howie sat on my lap when the game was over. I whispered in his ear. Maybe I will take him with me to Vegas after all. I went out to greet the mini-bus this afternoon. 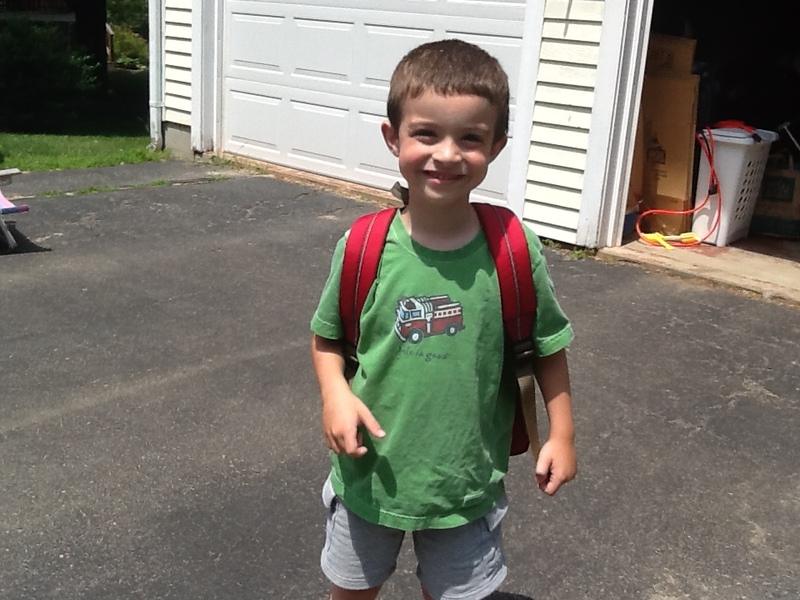 Howie was returning home from his second day of his Extended School Year program. I stepped up into the bus. Mrs. S, the bus monitor, looked at me. Gulp. Waiting for shoe to drop. Howie’s whole body puffed up with pride. Mrs. S said it looked like he grew an inch in that very moment. “Inside and out,” I said. 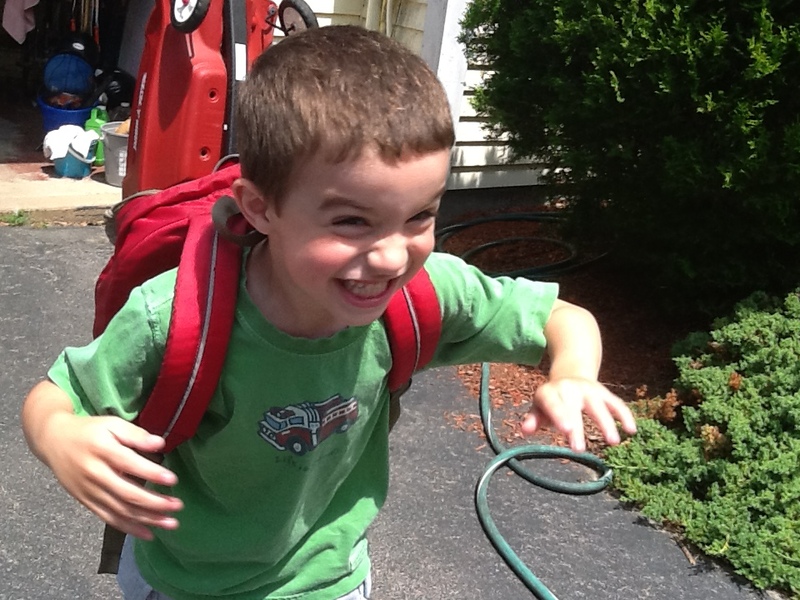 He came bouncing off the bus with a huge smile. “Did that make you feel good when Mrs. S said that?” I asked. And then the smile got bigger. And we went happily into the house. I’m not going to focus on the fact that his log sheet said he had a hard time at the program today and had to be removed. And I’m not even going to think about the three times he hit his home therapist today because she asked him to clean up. In this moment…it’s just about that smile and the pride it represents. And right now, that’s enough for me. It’s midnight. I am lying in bed, talking to Tim. It’s the only time we can talk alone now that the kids are home and awake way later than they should be. He’s referring to a few incidents, but mostly to an afternoon before school ended. Tim went in to volunteer in Howie’s class to help with a science project. Howie had a major meltdown over an experiment and left the classroom to calm down. Tim didn’t see him again until almost the end of the day. I nod silently in the dark. He’s not wrong, of course. And I know that. I’m VERY sorry that this happened, and I’m happy to hear that the students who did this are being punished. But this whole thing REALLY bothers me. I mean, we hear about bullying every day….yet this person had $650,000 donated to her in order to take a VACATION?!?!?!? What about the thousands of Autistic children who get bullied in school or on the bus every day? Where’s their $$ to take a trip to Disney World? Understand — I REALLY am sorry that Karen Klein had to go through this — NO ONE should have that experience. But the public response (on that score) is TOTALLY misdirected. I completely agree. It is absolutely awful what Ms. Klein endured. The children involved needed to be punished and I believe their suspension was appropriate and necessary. No one – NO ONE – should go through the kind of abuse that she did. But what happens when it’s kid versus kid? Is there the same outrage? What about my kid who doesn’t understand that someone is verbally abusing him? Or what happens when my kid is the one who fights back and gets in trouble because he’s the one with the behavior plan? What do I do? As parents…what do we do? All the girls in this video are 13. According to comments on the “Bully” movie Facebook page and a story from thAutcast.com, the video was taken by the girls perpetrating the attack. The autistic girl’s mom put the video on YouTube to show the world what happened to her daughter, but then took it down when the girls involved received hate mail and death threats. This copy of the video was left on YouTube. This video just makes me cry. How do I keep this from happening to my child? It’s July 4th. We’re on our way back from Target, getting some supplies for a holiday backyard party. A CD of some of The Beatles Greatest Hits is playing. I hear singing from the middle row of the mini-van. He catches my eye – just for a second – in the mirror. He looks away but smiles. I smile back. I will tell him to be proud of who he is. I must teach him to stand up for himself. I will show him that love is more powerful than hate. He already believes that love is all you need. I have to believe it’s enough.